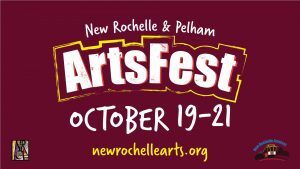 “ArtsFest” returns to New Rochelle and Pelham, kicking off on Friday, October 19th with an Arts in Oktoberfest Gallery Hop, then continuing all weekend with a full calendar of art events and activities. Highlights include behind-the-scenes tours of working artists’studios — including world renowned 3-D artist Charles Fazzino’s Museum Editions studio, where visitors can meet the artist and dabble in interactive arts projects – as well as a family art events at the BID Grand Market and Pelham’s Wolfs Lane Park, a Classic Car Show, a performance by Ajkun Ballet, and an ArtsFest music festival. Also on the menu are art exhibits at the Rotunda Gallery, Iona College, Montefiore NR and the New Rochelle Public Library, pop-up art exhibits at unexpected places, interactive activities at the Pelham Arts Center all weekend, and a free trolley providing transportation between four major points both days. “Each year ArtsFest grows in different directions,” observed NRCA President Theresa Kump Leghorn. “Last year the Arts in Oktoberfest gallery hop was so much fun that we are doing it again on Friday, November 19th, with beer and cider tastings at several different galleries from 6 to 8 pm. New this year we have an Artisan’s Market taking place at Ottavio’s Woodworking on Saturday and Sunday, a spoken word event in partnership with 650 on Sunday afternoon, and music, magic and face painting at Wolf’s Lane Park in Pelham.” The ArtsFest steering committee includes Leghorn and NRCA Board members Margaret Chadwick, Justin Christopher, Charles Fazzino and Angela Derecas Taylor along with Dave Fabris, Julie Maner, Charlotte Mouquin, Scott Seaboldt and Victoria Rolett. An official ArtsFest calendar will be mailed to city residents and available at venues as well as online. “Designing, printing and mailing the calendar, plus the cost of renting the trollies and other equipment really adds up, so we’re very grateful to the generous sponsors who make ArtsFest possible,” added Leghorn. ArtsFest sponsors include Gwendolen Appleyard Trust, Charles Fazzino, ArtsWestchester, Montefiore NR, NR Radiology, RXR, Hurley’s Steak House, Watermark Pointe, Alvin & Friends Restaurant, Gallery Roc, Tailgate Dogs and Sausages and AJ’s Burgers. Participating artists and venues as of press time include Alvin & Friends Restaurant, the Classic Car Show sponsored by AJ’s Burgers, College of New Rochelle, Marie Hines Cowan, Crashcup Studio, Dance Connection, Charles Fazzino Studio, Flowers by Sutton, Gallery Roc, High Brook Studios, Hudson Park Children’s Greenhouse, Hugh Doyle Center, Huguenot Children’s Library, Iona College Council on the Arts, Amelia E. Jones Studio, Lord and Andra, Museum of Arts & Culture, New Beginnings Dance Studio, NRCA Rotunda Gallery at City Hall, New Rochelle Public Library, Pelham Art Center, Pizzeria LaRosa, Queen City Gallery at Montefiore NR, Patricia Miner-Sutherland Studio, Thomas Paine Cottage Museum, Tailgate Dogs and Sausages, Martha Valenzuela, Westchester Yoga Center, and Wolfs Lane Park. Organized by the New Rochelle Council on the Arts, ArtsFest highlights the variety of arts and arts venues in New Rochelle and Pelham, with art exhibits, programs and family-friendly activities at more than 30 venues that give both visitors and residents alike a window into the city’s rich cultural and artistic diversity. The celebration will include live music, great food, exciting performances, and eclectic shopping. Visit the NRCA website at www.newrochellearts.org or email [email protected] for more information. This entry was posted in Press Releases and tagged artsfest. Bookmark the permalink.